Join us for a May Day Committee Meeting. Make plans for May Day including organizing internationalist contingents for May Day demonstrations and for getting out BA everywhere. 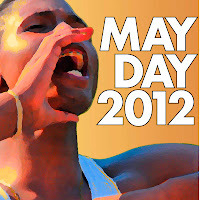 May Day 2012... the world is a horror for billions, but it doesn't have to be this way. Another world is possible, and in the face of this horror, the international proletariat, and people across this country and the world, declare their determination to fight for a world free of exploitation and oppression. May Day 2012... a time when, as we raise big money, we promote and popularize the work and vision of Bob Avakian to all corners of society. Because of BA and the work he has done over several decades summing up the positive and negative experience of the communist revolution so far, and drawing from a broad range of human experience, there is a new synthesis of communism that has been brought forward-there really is a viable vision and strategy for a radically new, and much better, society and world, and there is the crucial leadership that is needed to carry forward the struggle toward that goal. People everywhere need this; the world needs this. First, Revolution newspaper will be publishing a special issue that features quotes from BA that focus on internationalism and revolution to get out very broadly beginning on Tuesday, April 24, and stretching through the whole period around the holiday. Then beginning Saturday, April 28, for four defiant days we will be fighting for and promoting, living and, yes, celebrating-in the streets and with culture and fun-a vision of internationalism, revolution, a whole new and far better world... and the vision, strategy, and revolutionary communist leadership we have to get there. In these days, BA Everywhere-and the raising of big money-is going to gather up all those who have participated in this campaign and bust out all over in new ways. Taking the BA Everywhere campaign to neighborhoods to reach thousands of people withRevolution newspaper and BAsics, from the talks and writings of Bob Avakian. May Day Fundraising Dinner to Get Out BA Everywhere! Lake Merritt Lodge, 2332 Harrison St., Oakland 6-10pm, $10 and up. A day to get back to people, and to mobilize and gather forces into the Internationalist Contingents (to take part in Occupy's May Day actions). A Day for Fighting the Power and Transforming the People for REVOLUTION! As part of that, Internationalist Contingents will bring the special issue of Revolution to the May Day protests.